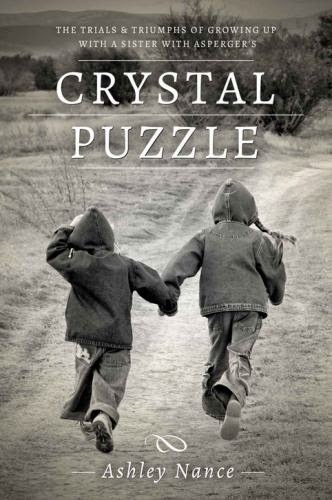 Crystal Puzzle is a very interesting book which offers a rather different point of view to the usual autism biography story. Normally these books are written by one of three people; the person with Asperger's Syndrome, that person's mother or that person's doctor. In this case the book has been written from the point of view of the sister (Ashley) of the person with Asperger's Syndrome (Crystal). What makes this approach so interesting is that both Ashley and Crystal grow up through the course of the book and as they do so, their points of view and opinions change. Christian Language: There are quite a few instances in the book where Ashley talks very openly about religion and a couple of passages feel like sermons. Since religion is a very personal thing, some people may find these parts a little uncomfortable. Abelist Language: There are many people who have major issues with the puzzle-piece symbol of autism because it suggests to them that people with autism or Asperger's syndrome are puzzles to be solved or people to be "fixed". Indeed, the notion of "fixing" does make an appearance in this book but not in an overly abelist sense. Nevertheless, some people may find this language a little uncomfortable. Crystal Puzzle is very much a book about sisterhood, growing up and acceptance. The story starts with Ashley's first thoughts that her sister is somehow different and moves quickly through the initial diagnosis because as a sibling, she was not made fully aware of her sister's diagnosis until much later. From there, Ashley's story covers playground friendships and bullying, special needs teachers, sibling rivalries and jealousies before moving on to the dating scene. There is a lot of good information in this section, particularly on female bullying and some of traits of Asperger's syndrome that lend themselves to exploitation. Along the way Ashley talks openly and honestly about her feelings and her thought processes - some of which seem very unfair and judgmental until you remember the age group she is describing. Children have a much more black and white view of their world and in any case, autism was far less understood twenty years ago than it is now. The book is about Crystal's journey to adulthood but it is Ashley's journey that is of the greatest interest. Ashley shows us how non-autistic siblings can be affected by their autistic counterparts and how they can often feel the need to take on the role of "fixer". The book aims to help siblings realize that they are not to blame for the poor choices made by siblings and ultimately promotes understanding and acceptance over the desire to control and fix individuals. This is a book which will work well for parents and teachers but is far more suitable for siblings, cousins and best friends of a similar age to the person with Asperger's syndrome or autism. It is in this area that the Christian language works particularly well as there is nothing in the wording or descriptions that could make this book unsuitable for a teen to read. The Crystal Puzzle by Ashley Nance is available from Familius as a printed book and from Amazon as a Kindle e-Book. Honesty clause: I was provide with a review copy of this book free of charge from Familius.com. I admit that I'm one of those who finds the puzzle metaphor to be an uncomfortable one because it was strongly asserted onto my family by those who wanted to fix my children specifically and my family in general. The more I've been able to fully grasp how I "straddle" the apparent divide between autistic and non-autistic--exhibiting some traits, but not all traits in "sufficient" degrees--the more I realize that the way I was able to understand my children is not accessible to everyone. I can see how a completely non-autistic person could see an autistic person as a puzzle to be solved; but, the reverse is equally true, where non-autistic people can be equally "puzzling" to autistic people. The problem isn't in the effort to understand, but in the assumption that one way is "right." This looks like an interesting book. I wonder if the sister who has Aspergers has read it, and how she felt about what the non-Asperger sister had to say? I attended a book signing last night for this book. Both sisters were in attendance. The sister with Asperger's was very happy with the book and in fact wanted to sign everyone's book along with the author. I am looking forward to reading this book.